Once my colleague, who’s a Linux guru, came up to me and asked if I could advise him on an external storage with several discs in a RAID; and a one that could be connected to the PC with eSATA or USB and managed with the help of hardware switches. To tell you the truth, I was completely baffled. The only thing that came to my mind at that moment was Thecus D0204 but we weren’t able to acquire it for testing. Fortunately, some time later we came across a whole family of such devices produced by the CFI Company. 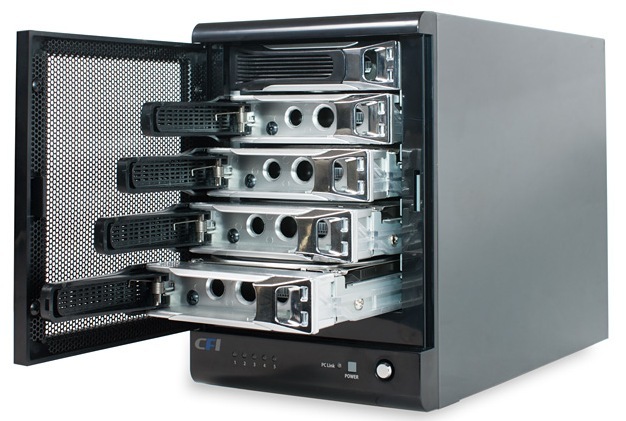 The technology of directly connecting the storage to the end node is called DAS (Direct Attached Storage), and today we are presenting to the reader a review of one of such devices - CFI CFI-B8253JDGG. 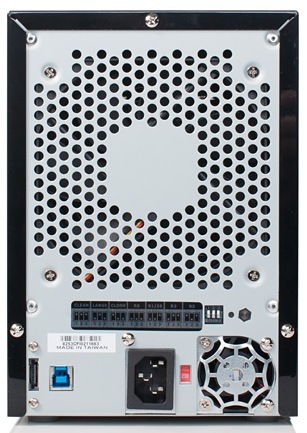 The CFI-B8253JDGG local storage has a design typical for desktop systems – a tower of 150*214*283 mm dimensions; its mass without discs is 4.2 kg. The upper and side walls are quite featureless; they have shiny surface where fingerprints and minor scratches are very conspicuous. This shiny solution doesn’t seem very practical. Most part of the front panel is occupied by a perforated door behind which there’re five baskets for installing hard drives. Under the trays there’re five LEDs reflecting the statuses of the discs and the RAID, a power indicator and that of the connection to the PC as well as the storage power button. On the bottom there’re four rubber stands for placing the storage steadily on the table. Mounting onto a rack without special shelves is not provided for. On the rear wall opposite the door there’s a 120 mm ventilator cooling the discs. Besides, here is a small 40 mm cooler of the inside power block as well as a slot for power connection and USB 3.0 and eSATA interfaces. 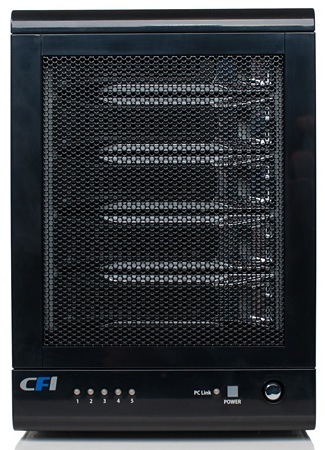 Unfortunately, the cooler of the power block makes much noise, which reduces to nothing the use of a full-sized tower ventilator; moreover, one of the inside boards almost completely blocks the air flow from the discs. The most unusual thing here is the set of three switches and the sunk Reset button which allow manually choosing the type the RAID being created. Although the use of such hardware switches looks rather out-of-date, it may be handy in certain situations. Jumping ahead of ourselves, we have to mention that the RAID can be managed not only with the help of such switches but also by using the utility that goes together with the device. 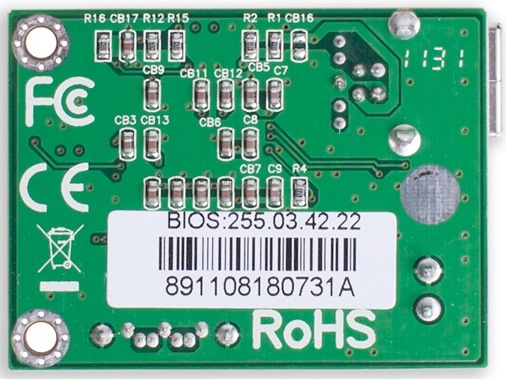 CFI CFI-B8253JDGG electronic filling is presented by two green textolite boards. 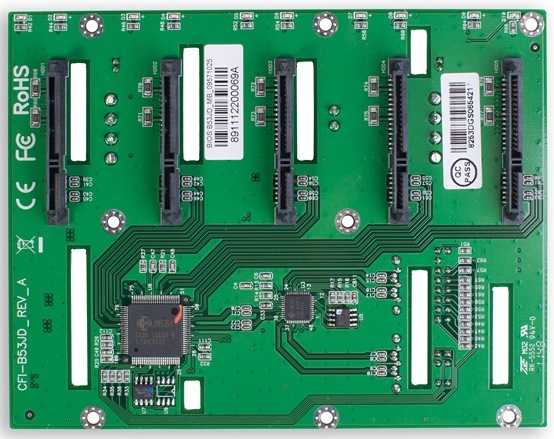 On one of the boards there’re slots for connecting discs and power as well as JMicron JMB394 controllers with five SATA-2 ports and JMicron JMB320. 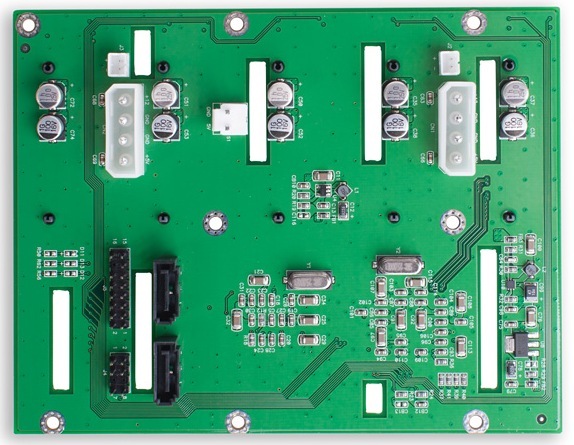 As the above-mentioned controllers support only the second version of the SATA-interface, the maximum speed that we’ll be able to achieve will be limited by the SATA-2 interface performance, that is 3 Gbps; employing SATA-3 discs will not result in any performance improvement. 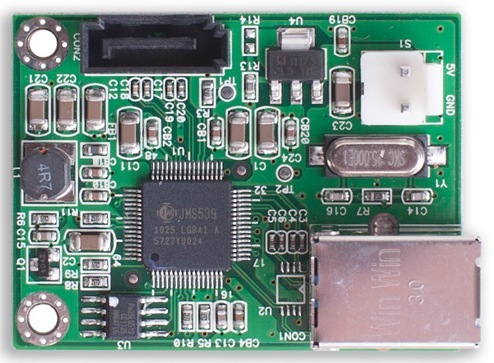 The second board holds a JMicron JMS539 chip responsible for transforming USB 3.0 and SATA-2 interfaces. 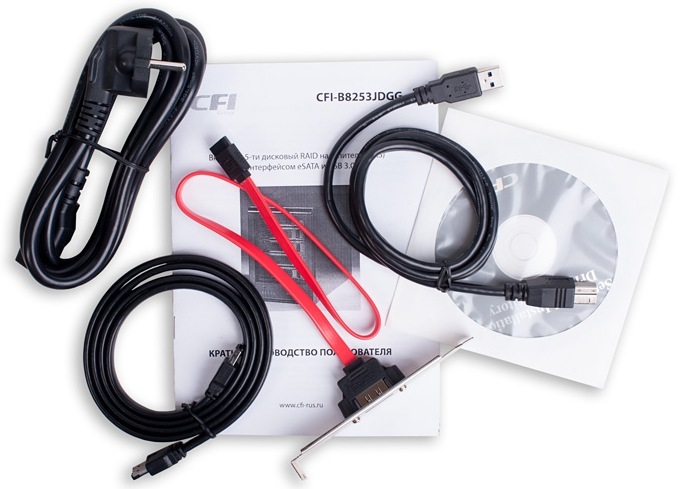 CFI CFI-B8253JDGG allows getting connected to its node either with the help of the eSATA interface or USB; using two interfaces together is impossible. Now let’s study the device software. 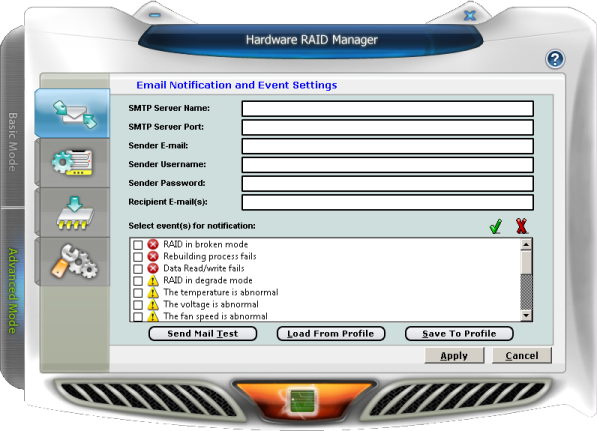 RAIDs can be created or deleted not only with the help of hardware buttons on the storage rear wall, but also with the help of software installed on the PC. 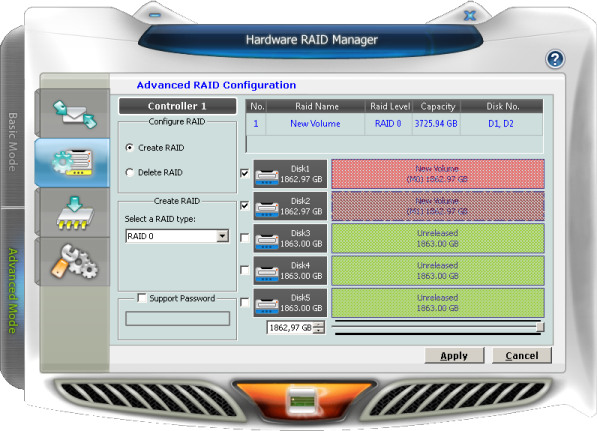 The Hardware RAID Manager utility not only allows managing RAIDs themselves but also provides the user with diverse information about the discs and the device itself. Unfortunately, the interface of the software at hand is only available in English. 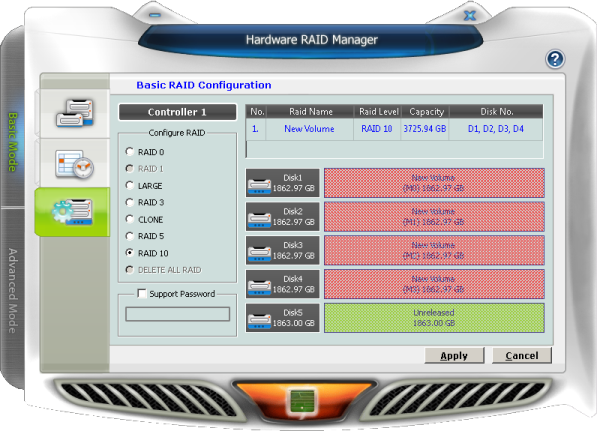 Hardware RAID Manager can work in a basic and an advanced mode. 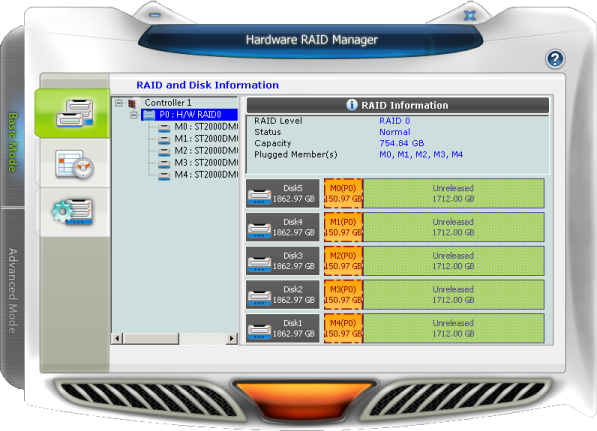 In the basic mode there’re three tabs available to the user: RAID and Disk Information, Event Log Viewer and Basic RAID Configuration with the help of which one can study information about the created RAID and utilized discs, get access to logs as well as create and delete RAIDs. The Email Notification and Event Settings tab of the advanced mode allows changing the parameters of sending e-mails about what is going on from the node the CFI-B8253JDGG storage is connected to. 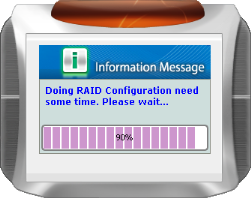 A RAID is created with the help of the Advanced RAID Configuration tab. Here the user can choose the type of the array, specify discs that will comprise it and set the maximum data volume available. The following RAID types are supported: RAID0, RAID1, RAID3, RAID5, RAID10, LARGE and CLONE. The two last modes are not exactly RAIDs, but rather ways of clustering discs. The LARGE mode unites a group of physical discs in such a way that the group volume is equal to the volume of the discs comprising it. When CLONE is used, information is simply copied to each of the discs. 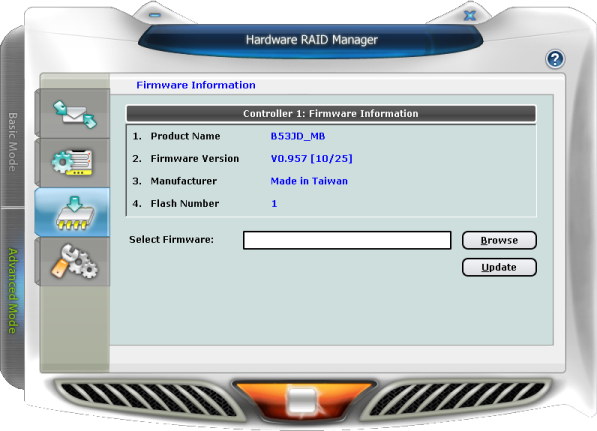 The Firmware Information tab is intended for upgrading the device firmware. When the article was being written, there were no new firmware versions to download, so we weren’t able to run the upgrade process. The parameters of automatic power-off and the RAID rebuild priority settings are gathered in the RAID Settings tab. 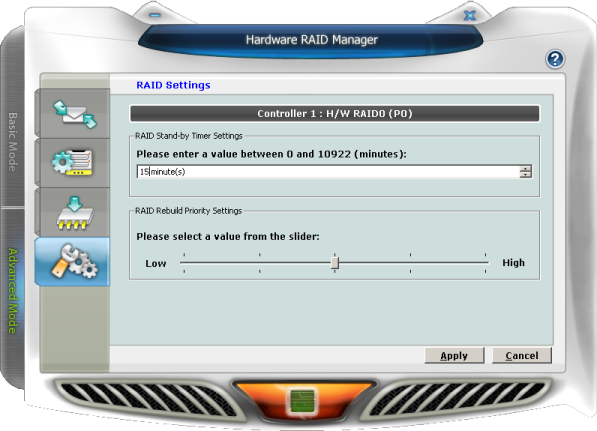 Here we’re through with the review of the Hardware RAID Manager utility and are moving on to testing itself. Almost immediately after turning on DAS CFI-B8253JDGG is ready to work; here we don’t see the delay typical of all network storages. To test CFI-B8253JDGG performance we used the Intel NASPT utility version 1.7.1; the main parameters of the testing stand are presented below. In testing we used Seagate ST2000DM001 hard drives. We would like to specifically mention that we intentionally decreased the size of RAM available to the system with the help of the msconfig utility according to the recommendations of Intel. The purpose of this was to prevent local cashing from distorting measurements results. Unfortunately, most laboratories in Russia and abroad ignore these recommendations. We decided to connect the device at hand to the PC with the help of both interfaces in turn, so diagrams below are presented for both connections. The chosen file system was NTFS as the limitations of FAT32 don’t allow full testing of the device. Unfortunately, when eSATA was used, the DirectoryCopyToNAS Throughput test produced inadequate results, so we excluded this test from the corresponding diagram not to confuse our readers. The Intel NASPT 1.7.1 utility is a severe loading test, consequently, the data received in our test will be more modest than can be obtained in other synthetic tests. Although we understand that the end user is highly unlikely to use FAT32, we still decided to run a comparative test for two file systems for RAID0. 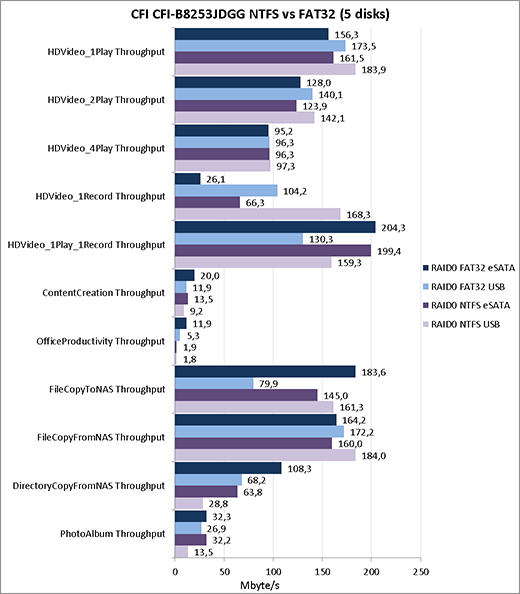 Although the obtained speeds are only half of the eSATA interface, we still think the presented values to be quite good for the performance of such class of devices. On the whole we were quite happy with the tests of this DAS – the device that was new to us. CFI CFI-B8253JDGG displayed good speeds for decent money. The advantages of the local storage are listed below. Simplicity of installation and use. The ability of software and hardware management of the disc array. Presence of two interfaces (USB and eSATA) for connecting to a node. However, we can’t but mention the device disadvantages. Unlucky interior design (wires can be damaged when discs are installed, poor disk ventilation). Impossibility of migration between RAIDs. The managing utility is available only in English. High noise of the power block cooler. Shiny side walls are easily scratched. 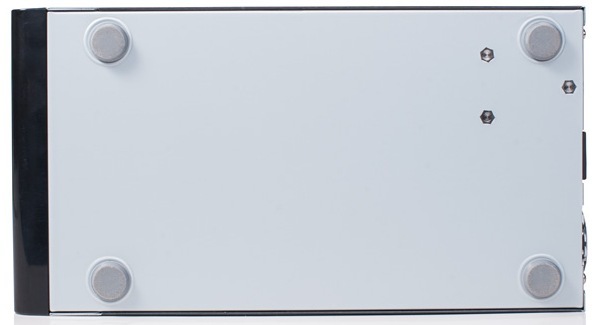 We think that the Chyang Fun Industry Company could start producing such devices of the rack-mounted type for connecting them to enterprise network storages that have external eSATA or USB interfaces for expanding the available disc space. 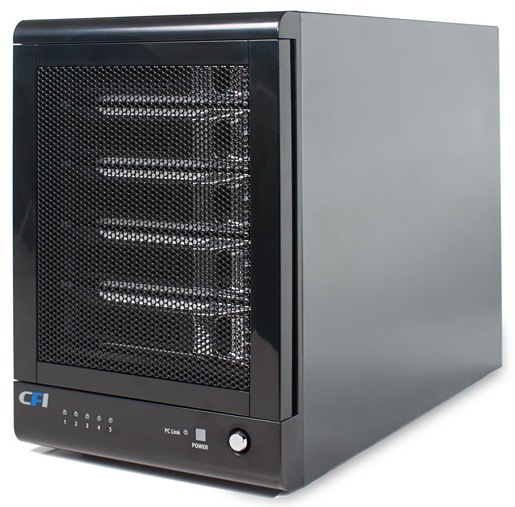 As most rack storages of different vendors have these interfaces, such product (to serve as an independent disc enclosure) would almost certainly find its customer. When the article was being written, the average price for CFI CFI-B8253JDGG (without discs) in Moscow online shops was 7900 RUB. The author and the editorial team would like to thank the DNS digital store for the equipment provided for testing.